Abstract. Changes in margins derived from satellite imagery are quantitative indicators of the environmental processes and drivers acting on the Earth's surface, for example retreating ice margins or coastal changes with rising sea level. However, the large-scale rapid visualisation and analysis of the satellite record is often impractical due to factors such as computer processing power, software availability, internet connection speed and/or user expertise in remote sensing. Here are presented three new, freely accessible tools that together can be used to process, visualise and review data from the full Landsat 4–8 and Sentinel 1–2 satellite records in seconds, enabling efficient mapping (through manual digitisation) and automated quantification of margin changes. These tools are highly accessible for users from a range of remote-sensing expertise (from academics to high school students), with minimal computational, licensing and knowledge-based barriers to access. The Google Earth Engine Digitisation Tool (GEEDiT) allows users to define a point anywhere on the planet and filter data from each satellite for user-defined time frames, maximum acceptable cloud cover extent, and options of predefined or custom image band combinations via a simple graphical user interface (GUI). GEEDiT allows georeferenced vectors to be easily and rapidly mapped from each image, with image metadata and user notes automatically appended to each vector, which can then be exported for subsequent analysis. The GEEDiT Reviewer tool allows users to quality control their own/others' data and also filter existing datasets based on the spatial/temporal requirements for their particular research question. 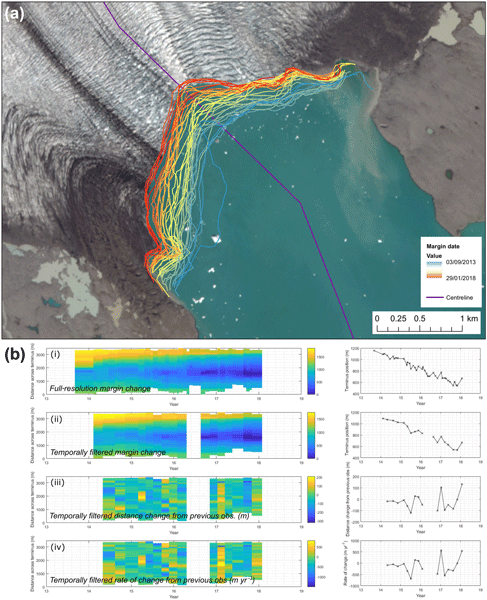 The Margin change Quantification Tool (MaQiT) is complementary to GEEDiT and GEEDiT Reviewer, allowing the rapid quantification of these margin changes by utilising two well-established methods that have previously been used to measure glacier margin change and two new methods via a similarly simple GUI. A case study of the lake-terminating glacier Breiðamerkurjökull, Iceland, is used to demonstrate the complementary functionality of GEEDiT, GEEDiT Reviewer and MaQiT, though it should be noted that MaQiT is also suitable for the (re-)analysis of existing datasets not generated by GEEDiT. 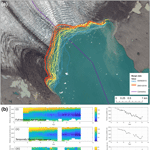 MaQiT has been developed with the original aim of quantifying tidewater glacier terminus change, though the methods included within the tool have potential for wide applications in multiple areas of Earth surface science (e.g. coastal and vegetation extent change). It is hoped that these tools will allow a wide range of researchers and students across the geosciences to efficiently map, analyse and access volumes of data that would have previously proven prohibitive. How to cite: Lea, J. M.: The Google Earth Engine Digitisation Tool (GEEDiT) and the Margin change Quantification Tool (MaQiT) – simple tools for the rapid mapping and quantification of changing Earth surface margins, Earth Surf. Dynam., 6, 551-561, https://doi.org/10.5194/esurf-6-551-2018, 2018.